First up, the winners of my Pedi-Sox giveaway. Jessi. N. and Katie L. I've sent you both an email. Congratulations. Now to today's nails. The other night I was busy working on a non-nail related project with my husband, and when we were finished it was close to 11pm and I hadn't even painted my nails yet. 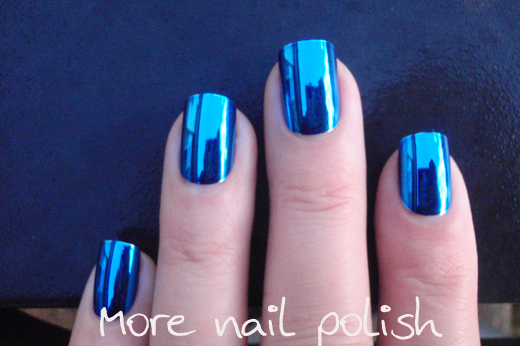 The previous week I had purchased some press on chrome metallic blue nails that were on sale for a few dollars at Woolworths. I thought 'what the hell', and pulled the packet out. I quickly sized up the nails to see which would be the best fit. 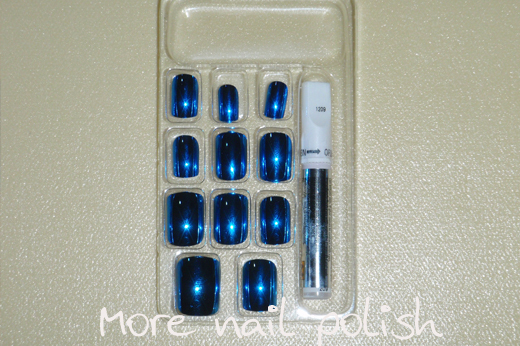 The packet came with either nail glue or sticky tabs to stick them to your nails. I chose to use the sticky tabs and I stuck one on every nail. Then one at a time I pulled the backing paper off the sticky tab and stuck the right sized nail on. The whole process took me less than ten minutes and quite seriously, they look bloody amazing. They are soooooo mirror like and reflective! This photo was taken the net morning just as the sun is appearing over the horizon. You can see the dotted white clouds int he sky, a few tree reflects at the bottom of the nail and some camera reflections too. The package contains 24 nails in eight sizes, so I had no trouble finding the right fit. I love the uniformity of these stick on nails. Every nail was the same length, and the exact same shape. They also have a really nice natural looking length-ways curve. Only one or two of my nails curve that way naturally, so I really liked that look So many people commented on my nails whist wearing these. The sticky tabs worked brilliantly. Every nail stayed stuck on really well all night, during two showers, multiple hand washings and a full day at work. They were easy to remove too, with just a soak in some warm soapy water and then gently lift off. Each nail was still perfect, so I will be able to wear these over and over again as long as I have plenty of those sticky tabs - I'll have to see if i can buy those separately. Woolworths also had these in hot metallic pink and in silver, but neither of them were on sale. After having worn these , I'm tempted to go back and pay retail for the other sets. 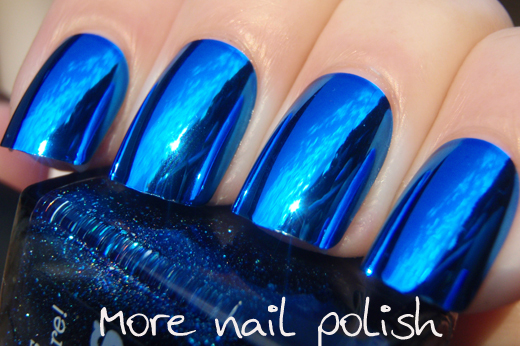 Seriously - I want a nail polish this shiny (and I want my nails to look this uniformly perfect)! Edited to add: OK, I searched through my nail polish rubbish bag and found the rest of the packaging for these nails. The brand is 1000Hour and they are called Metallic Nailz. Here is their website that shows them all, although like I said, I got my for $4 from Woolies.If you google them, you can see they are available from a bunch of places. 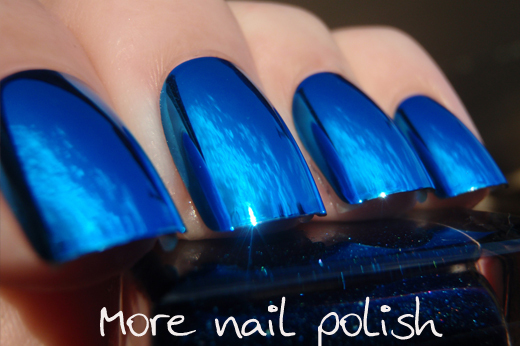 IF ONLY polish could be this shiny <3 Love these! Oh my goodness, they look AMAZING and I absolutely want them!!! Those look gorgeous. Press-on nails have come a long way. They look amazing! Agreed, I wish polish could achieve the same effect! Those are amazing! Great photographs to showcase all the crazy shininess! Do you happen to know the brand name or if they are available any where else besides Woolworth? I've found a website and linked it above in the post. beauuuutiful and so nice looking. eye catching, good choice. Oh my goodness!!! SO SHINY *. 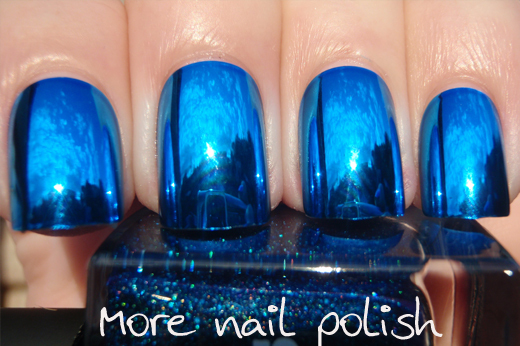 * they most definitely need to make a polish this gorgeous! I love the colour! What is the brand name on the packet? Might have to check them out. I totally thought this was a polish that I had to make!! RWT doesn't have this metallic of a finish and I'll be sad not to have it! Nice! OH MY GOOOOOOOD! That is amazing! Love it! Wow! These are super cool and would be great for a night out with friends.